Improve your team projects by applying Marginal gains on their components. Marginal Gains is a philosophy that aims to improve a project by breaking it down into tiny components and then by making small improvements to each of them. The overall aggregate gain will lead to the sought after improvement. The philosophy of Marginal Gains was conceived by Dave Brailsford who became the program director of British Cycling in the early 2000s. In 2010 he was given the objective of having a Briton win the Tour de France, quite a task given that no Briton had ever come close to winning this race. 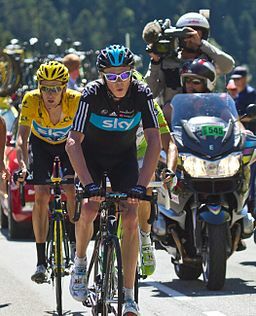 After applying his ideas Briton Bradley Wiggins won the tour in 2012 followed by Chris Froome in 2013. Added to these successes the British team profited from this philosophy and have dominated world indoor events including the 2012 Olympics. 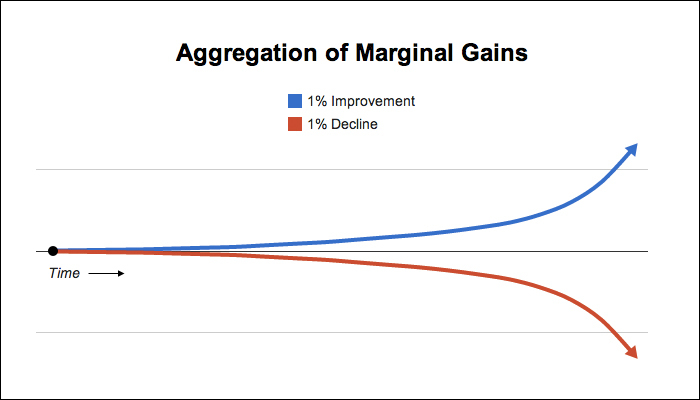 In his blog James Clear argues that the converse of marginal gains (marginal decline) can result in an aggregate deterioration. So many small poor decisions could lead to a problem. This application provides a template that helps to itemize the components and encourages the user to break down components even further in order to focus on the finest details. A new TWiki topic is created for each component and an improvement action can be created to each of these components. The application makes use of several Plugins including the ActionTrackerPlugin and the CommentPlugin. A map of the process is also provided using the TreePlugin. In this example a club's management looks to better the performance of its football team. First they think of everything that could affect the performance of the team. Once these components have been identified they try and break them down again and again and look for items to improve. For this example I have used an indented list for each child component (a mind-map also works very well for this). Click the twisty below to see the start of a breakdown of the team into small components. A possible action can be attributed to each component. In this list the icon is used to show a possible action. Corner kick from the right - practice from the left too. Lights - install better lighting. Food - supplying some may bring in more fans. Drink - supplying some may bring in more fans. Gate money - introduce tombola with entry fee. The manager then creates components and actions based on the above information. You do not need to install anything on the browser to use this add-on. These instructions are for the administrator who installs the add-on on the server where TWiki is running. Go to the MarginalGainsProjects topic and create a new project. Create components and then further child components if necessary. Create actions for Marginal gains where appropriate. Comment : this is free text but should include the subject and purpose for the action. 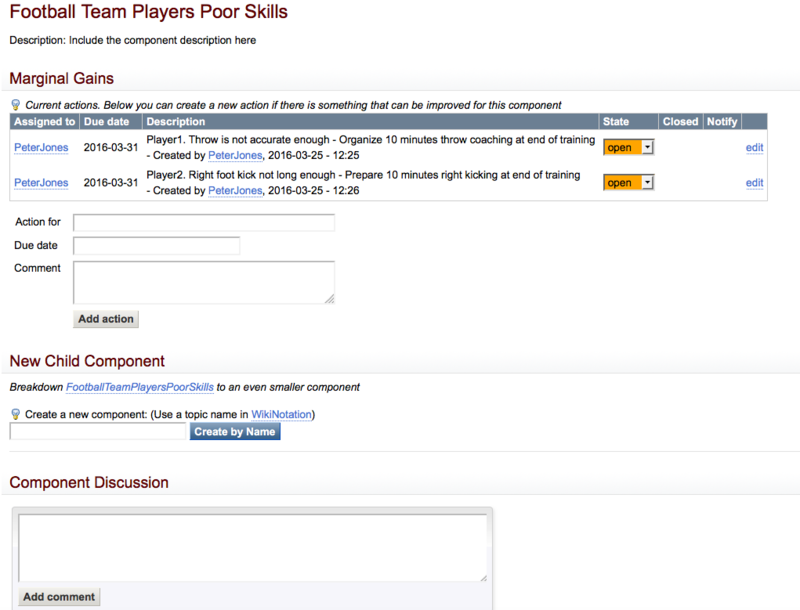 Set SHORTDESCRIPTION = Improve your team projects by applying Marginal gains on their components. Other Dependencies: ActionTrackerPlugin , CommentPlugin and TreePlugin.